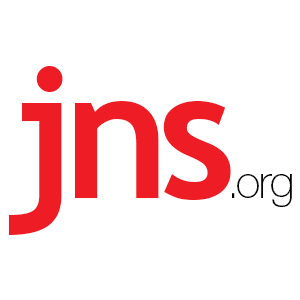 Major Jewish Organizations Back Israel’s BDS Entry ban, Barred Group Calls it ‘Bullying’ - Breaking Israel News | Latest News. Biblical Perspective. The Palestinian Authority flag is featured at a Jewish Voice for Peace (JVP) protest in New York City last September. Credit: JVP via Facebook. Israel’s Ministry of Strategic Affairs on Jan. 7 released a preliminary list of 20 foreign organizations whose “central figures” will not be permitted to enter Israel because they have undertaken “significant, ongoing and consistent harm to Israel through advocating boycotts.” There are six American groups on the list, including the American Friends Service Committee, American Muslims for Palestine, Code Pink, Jewish Voice for Peace (JVP), Students for Justice in Palestine and the U.S. Campaign for Palestinian Rights. JVP Executive Director Rebecca Vilkomerson told JNS that until now, she has been traveling to Israel “approximately once a year, and those trips are usually a mix of personal visits and JVP work.” Vilkomerson said the Israeli government “has not been in touch with us in terms of how they define JVP leadership,” so it is not clear if the ban will apply only to JVP’s senior staff or also to its other arms, such as its Academic Advisory Council. A spokesperson for the Israeli Ministry of Strategic Affairs and Public Diplomacy told JNS that the determination regarding exactly who will be prevented from entering will be based on whether an individual engages in “ongoing, consistent, and significant action to promote the boycott, with each case being judge on its own merits.” The spokesperson said an inter-ministerial team is still in the process of “formulating the criteria for implementation of the legislation,” with a final list of banned organizations likely to be released in March. JVP’s Vilkomerson described the Israeli ban as “bullying.” That characterization was challenged by Malcolm Hoenlein, executive vice chairman and CEO of the Conference of Presidents of Major American Jewish Organizations, who told JNS, “For JVP to complain about ‘bullying’ is the height of hypocrisy given their tactics.” He was referring to incidents in which JVP activists reportedly have harassed pro-Israel speakers. 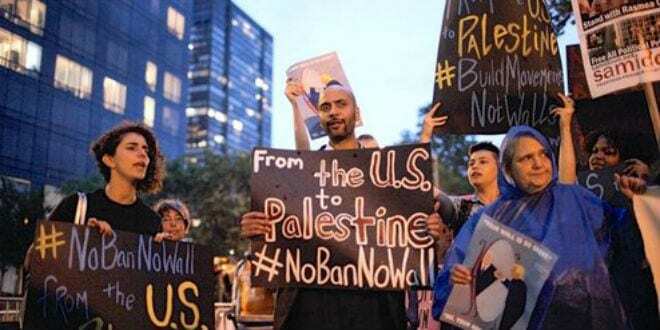 Protesters compare President Donald Trump’s proposed U.S.-Mexico border wall to Israel’s West Bank security fence at a Jewish Voice for Peace (JVP) demonstration in New York City last September. Credit: JVP via Facebook. A number of leading Jewish organizations have expressed support or understanding for the Israeli government’s Jan. 7 decision. When the Knesset last year gave preliminary approval to a law restricting the entry of foreign BDS advocates, the ADL and the American Jewish Committee (AJC) expressed disapproval. When contacted by JNS this week for their position on the new government decision—which is more limited than the Knesset bill because it specifically names 20 groups, rather than being a blanket ban—both the ADL and AJC did not respond. Section 212 of the current U.S. immigration law authorizes the exclusion of foreign citizens who are suspected of intending to engage in “any activity” related to “sabotage” of the government. It also prohibits the entry of anyone who “endorses of espouses terrorist activity,” even if they are not involved in actual terrorism. Restrictions on admission to the U.K. are even broader. Section 2 of the relevant British law states that a foreigner can be prevented from entering the country if the authorities decide that “the applicant’s character, conduct or associations” make it “undesirable” to grant entry. Tagged with: Academic Advisory Council AIPAC American Friends Service Committee American Jewish organizations American Muslims for Palestine Anti-Defamation League (ADL) B’nai B’rith BDS Betty Ehrenberg Chicago Dyke March Code Pink Conference of Presidents of Major American Jewish Organizations Israeli Ministry of Strategic Affairs Jewish Voice for Peace (JVP) Malcolm Hoenlein Marshall Wittman Orthodox Union (OU) Paul Scham Pro-Israel Rabbi Pesach Lerner Rebecca Vilkomerson Students for Justice in Palestine the U.S. Campaign for Palestinian Rights.